When you create a new paper, you choose the language of the content collected on the first screen (option to choose language only appears after you begin to type at least three characters). 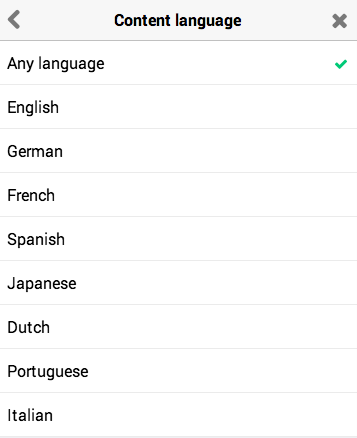 If you would like to edit the language of your content (English, German, French, Spanish, Japanese, Dutch*, Portuguese, or Italian*) after your paper has been created or change your content to include any language you can visit your paper settings and select your choice. To find your language settings in your Paper Settings Dashboard, choose Content > Advanced Settings > Content language. Although you as the publisher have control over the language of the articles that are fetched, your readers control which language they see the menu, date headings of your paper.li paper, and the bookmarklet. In the footer of your paper, the reader has the following language choices: EN DE FR ES PT 日本語. Using the Paper.li News Page App on your WIX site? For papers created with the News Page app, the language of the paper menus and topic sections will depend on the language set in the reader's browser. Email subscription emails are in English. The language used for email subscription/newsletters is not set globally by the publisher for all his readers. For a subscriber to change the language he is receiving the emails, he should unsubscribe to the paper, change the language settings of the paper using the options in the footer, and then resubscribe. * Fetching content in Dutch and Italian is in beta. Although we are able to fetch content in both those languages, not all functionality is available. As a result, if you are searching for content in these languages, the tweets and the User Interface will nevertheless default to English .